Over 22 years of experience in IT including business requirements gathering and analysis, data modeling, solution architecture, application design and development, implementation and maintenance. Over 13 years of experience in management with more than 7 years in IT projects and operations. Over 18 years of experience in data warehousing, business intelligence and analytics development. Domain experience includes airline reservations, financial services, IT consulting, SaaS, sportswear, state government and video streaming. Drove business intelligence and data warehouse solutions to meet customer needs. Responsibilities include: project management, recruitment and business development. Drove business intelligence and data warehouse solutions to meet customer needs. Responsibilities include: project management, recruitment, business development, technical and sales support. AWS Certified Solutions Architect – Associate (CSAA). 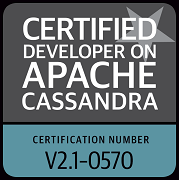 DataStax Certified Developer on Apache Cassandra. Cloudera Certified Administrator for Apache Hadoop (CCAH): CDH4. Cloudera Certified Developer for Apache Hadoop (CCDH): CDH3. Microsoft Certified IT Professional (MCITP): Business Intelligence Developer. Microsoft Certified Technology Specialist (MCTS): SQL Server 2005 Business Intelligence. ITIL V3 Foundation in IT Service Management. 2004 Governor’s Award for Quality and Performance – Financial Management. 2004 Federation of Tax Administrators (FTA) National Award for Data-Driven Decisions Initiative. Recognized in September 2003 issue of DM Review Magazine, Industry Standard Technologies – The Road to Success. Washington State Department of Revenue Exceptional Employee Recognition 2003. Washington State Department of Revenue Quality Improvement Award for Financial Information System Re-write 2002. Member of University of Washington Alumni Association since 2008. Copyright © 2019 Amos Chong. All Rights Reserved.